Remaining as one of the most vital asset classes in the industry, the real estate and property sector continues to indicate healthy growth prospects. This positive outlook is supported by the maintained level of investments in real estate assets across the globe, particularly in the UK and the US. This 1-day seminar, delivered by senior Islamic real estate deal-makers, will look at global real estate trends and opportunities and tackle the value proposition Shariah-compliant deals bring to this dynamic market. How do Shariah-compliant real estate transactions differ from the traditional and what legislations and tax structures in Europe and the UK affect these transactions? The real estate investment continues to evolve with the entrance of new high potential markets, new regulations and the introduction of innovative structures and assets. 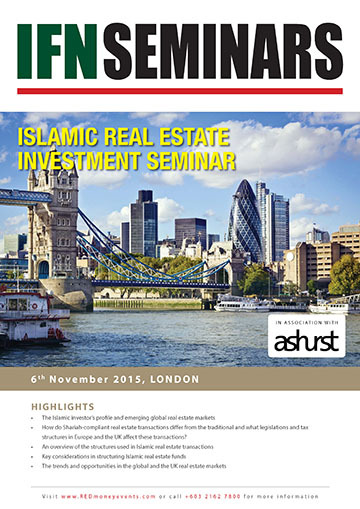 This seminar will bring global real estate to London featuring real estate investment experts from key markets. Should you be a real estate practitioner, investor or a lawyer involved in structuring real estate transactions, Shariah-compliant or otherwise, this one-day seminar has something for you. Use this opportunity to assess the potential of what Islamically structured transactions have to offer the market.